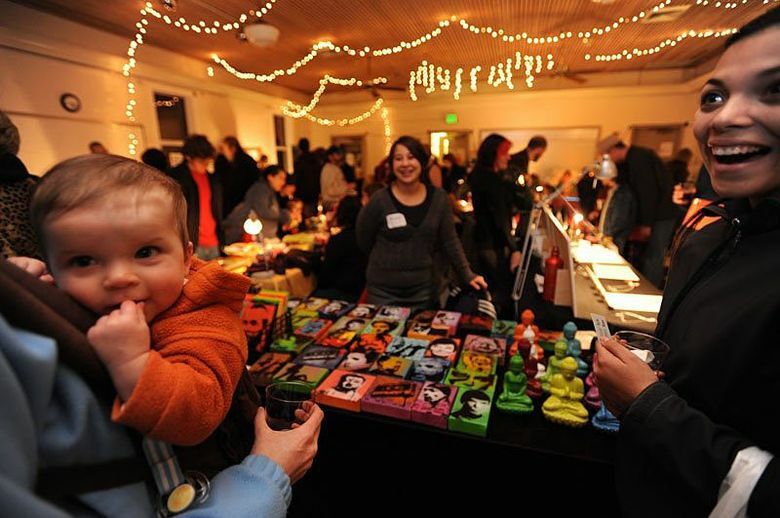 A list of where to find art and handcrafted items for holiday giving around the Puget Sound region. ENDS 11/30 An exhibit featuring ceramics and painted textiles by Doe Stahr, cedarbark baskets and vases by Duwamish/Suquamish weaver DeAnn Jacobson and serving pieces designed by Tlingit/Kwakiutl artist Corinne Hunt. 10 a.m.- 6 p.m. Monday through Friday, 10 a.m.-5 p.m. Saturday, 11 a.m.-4 p.m. Sunday, Raven’s Nest Gallery, 17508 Vashon Highway S.W., Vashon (206-567-5826 or vashonravensnest.com). ENDS 12/24 Two-dimensional works by members of the artist guild, Seattle Co-Arts, as well as pottery and glass by regional artists. 10 a.m.-6 p.m. Monday through Friday, 10 a.m.-5 p.m. Saturday, noon-5 p.m., Schack Art Center, 2921 Hoyt Ave., Everett (425-259-5050 or schack.org). ENDS 1/3 Works by 30 gallery artists. 11 a.m.-4 p.m. weekdays, 10 a.m.-5 p.m. weekends. 10 a.m.-5 p.m. Saturday and Sunday, 11 a.m.-4 p.m. Monday through Friday, Tuesdays by appointment, Rob Schouten Gallery, 765 Wonn Road, #C103, Greenbank (360-222-3070 or robschoutengallery.com). ENDS 1/3 10 a.m.-4 p.m. Monday through Friday, East Shore Gallery, 12700 S.E. 32nd St., Bellevue (425-747-3780). Component post 9830597 could not be found. TODAY Nordic Christmas celebration and sale of handcrafted wares, traditional Scandinavian Christmas food and drinks, music and dancing, visit from Santa, raffle, silent auction. 10 a.m.-5 p.m. Sunday. Nordic Heritage Museum, 3014 N.W. 67th St., Seattle, $5, children free (206-789-5707 or nordicmuseum.org). TODAY Juried show and sale of gourd art. 10 a.m.-4 p.m. Sunday. Country Village, 23718 Bothell-Everett Highway, Bothell, free (wagourdsociety.org). OPENS NOV. 23, ENDS 12/18 Artists from the Gage community will exhibit and sell small works throughout the holiday season. 9:30 a.m.-4:30 p.m. Monday through Friday, Gage Academy of Art, 1501 10th Ave. E., Seattle (206-323-4243 or gageacademy.org). OPENS NOV. 27, ENDS 12/18 A show and sale of works by more than 20 local artists. Artists’ reception, 1-4 p.m. Sunday, Dec. 6 and 5-8 p.m. Thursday, Dec. 17. 10 a.m.-6 p.m. Tuesday through Saturday, noon to 5 p.m. Sunday, Gallery North, 401 Main St., Edmonds, free (425-774-0946 or gallerynorthedmonds.com). NOV. 28-29 A sale of handcrafted items from local artists. 11 a.m.-5 p.m. Nov. 28-29. Skagit County Historical Museum, 501 S. Fourth St., La Conner, free (360-466-3365 or skagitcounty.net/museum). NOV. 29 A sale of prayer beads, jewelry, statues, prayer flags, incense, clothing, art prints, books, CDs and Himalayan art calendars. 11 a.m.-4 p.m. Nov. 29. Sakya Monastery of Tibetan Buddhism, 108 N.W. 83rd St., Seattle, free (206-789-2573 or sakya.org). DEC. 2-5 A show and sale of holiday art. 10 a.m.-8 p.m. Dec. 2-4, 10 a.m.-5 p.m. Dec. 5. Northwest Art Center, 9825 N.E. 24th St., Bellevue, free (bellevuehilltopholidaycraftshow.com). DEC. 3 The museum stays open late with tours of exhibits, lectures, children’s crafts, refreshments and a visit from Fjällräven. 10 a.m.-8 p.m. Dec. 3. Nordic Heritage Museum, 3014 N.W. 67th St., Seattle, free (206-789-5707 or nordicmuseum.org). DEC. 3 Purchase tile work, sculpture, and functional ware by clay artists from the Puget Sound region. Proceeds benefit the ceramics program at Bellevue College. 10 a.m.-6 p.m. Dec. 3. Bellevue College Gallery Space, 3000 Landerholm Circle SE, Bellevue, free (425-564-2788 or depts.bellevuecollege.edu/galleryspace). OPENS DEC. 3, ENDS DEC. 26 11 a.m.-6 p.m. Thursday and Friday, noon-5 p.m. Saturday and Sunday or by appointment, Fountainhead Gallery, 625 W. McGraw St., Seattle (206-285-4467 or fountainheadgallery.com). DEC. 4-6 Self-guided tour of artists’ studious throughout Bainbridge Island. 10 a.m.-6 p.m. Dec. 4-5, 10 a.m.-5 p.m. Dec. 6. Downtown Bainbridge Island, Winslow Way E., Bainbridge Island, free (bistudiotour.com). DEC. 4-24 A show and sale of works by more than 40 Pacific Northwest clay artists. Opening night reception, 6:30-9:30 p.m. Friday, Dec. 4. Noon-7 p.m. Monday through Friday, 10 a.m.-6 p.m. Saturday and Sunday, Dec. 4-24. Seward Park Clay Studio, 5900 Lake Washington Blvd. S., Seattle, free, admission to opening party is a suggested donation of $10 (206-722-6342 or sewardparkart.org). DEC. 4-6 A self-guided tour of historic cottages, farms, hand-built homes and nonprofit venues; food and music. 10 a.m.-5 p.m. Dec. 4-5, 11 a.m.-5 p.m. Dec. 6. Downtown Bainbridge Island, Winslow Way E., Bainbridge Island, free (christmasinthecountry.info). DEC. 4-6 A self-guided tour of seven artists’ studios and galleries in North Seattle featuring works by 27 local artists. 5-8 p.m. Dev. 4, 10 a.m.-5 p.m. Dec. 5-6. Tribal Zone Studio, 12807 23rd Ave. N.E., Seattle, free (neatseattle.com). DEC. 4-6, 12, 19 Self-guided tour of 12 studios throughout Seattle featuring artwork by 48 artists. 4-9 p.m. Dec. 4, 10 a.m.-5 p.m. Dec. 5-6, 12 and 19. Blowing Sands Glass Studio, 5805 14th Ave. NW, Seattle, free (seattlesampling.com). DEC. 4-6 A craft show and sale with handcrafted goods, clothing, jewelry, gifts, bags, wallets, buttons, accessories, aprons, children’s goods, toys, housewares, furniture, paper goods, candles, kits, geekery, art, food and more. Preview night, 5-9 p.m. Friday, Dec. 4. 10 a.m.-6 p.m. Dec. 5, 10 a.m.-5 p.m. Dec. 6. Seattle Center Exhibition Hall, 299 Mercer St., Seattle, free, admission to preview party is $8 (urbancraftuprising.com). DEC. 5 A sale of baked goods and handmade crafts, all donated by our volunteers and supporters. All proceeds benefit MEOW Cat Rescue. Noon-5 p.m. Dec. 5. Northlake Unitarian Universalist Church, 308 Fourth Ave. S., Kirkland, free (meowcatrescue.org). DEC. 5 A community celebration of music, art and creativity with live models, live music, open studios and art activities for the whole family. A wide variety of drawing materials will be provided at no cost and each studio will be filled with easels waiting for artists. 9 a.m.-6 p.m. Dec. 5. Gage Academy of Art, 1501 10th Ave. E., Seattle, free (gageacademy.org/drawingjam). DEC. 5 A show and sale of artwork by local artists and KAC students, drawing jam with live costumed models, artist’s demonstrations, live music and more. 10 a.m.-7 p.m. Dec. 5. Kirkland Arts Center, 620 Market St., Kirkland, free (425-822-7161 or kirklandartscenter.org). DEC. 5-6 Holiday sale with works by local artists, plus handcrafted wreaths. 10 a.m.-7 p.m. Dec. 5, noon-5 p.m. Dec. 6. Soulumination, 5201 11th Ave. N.W., Seattle, free (soulumination.org). DEC. 5 A sale of handmade wares by potters at the Moshier Community Art Center including mugs, bowls, serving dishes, casseroles, garden art, jewelry, planters and more. 10 a.m.-3 p.m. Dec. 5. Moshier Community Art Center, 430 S. 156th St., Burien, free (burienwa.gov). DEC. 5 A sale of arts and crafts. 10 a.m.-3 p.m. Dec. 5. Ravenna-Eckstein Community Center, 6535 Ravenna Ave. N.E., Seattle, free (206-915-2648 or facebook.com/events/1484663761841673). DEC. 5 A sale of multicultural books, jewelry, fashion accessories, glassware and gift ideas. 10 a.m.-3 p.m. Dec. 5. St. Peter’s Episcopal Church, 1610 S. King St., Seattle, free (stpeterseattle.org). DEC. 5-6, 12-13 Self-guided tour of artist studios on Vashon Island. 10 a.m.-4 p.m. Dec. 5-6 and Dec. 12-13. Various locations throughout Vashon Island; free (vashonislandartstudiotour.com). DEC. 5-6 A show and sale of locally handcrafted jewelry, bead work, metals, fiber arts, cards, fine arts and photography. 10 a.m.-4 p.m. Saturday, Dec. 5, 9 a.m.-1 p.m. Sunday, Dec. 6. Unity of Bellevue Church, 16330 N.E. Fourth St., Bellevue, free (425-747-5950 or unityofbellevue.org). DEC. 6 A showcase of works by studio artists. 1-6 p.m. Dec. 6. Inscape Arts, 815 Seattle Blvd S., Seattle, free (inscapearts.org). DEC. 10 Schack hosts an after-hours event for teens to hang out, meet other artists, and learn new techniques while trying different art projects including holiday cards and other projects to give as gifts. 6 p.m. Dec. 10. Schack Art Center, 2921 Hoyt Ave., Everett, free (425-259-5050 or schack.org). DEC. 11-12 A show and sale of ceramic work by 14 artists with drinks and snacks provided. 5-8:30 p.m. Friday, Dec. 11, 10 a.m.-4 p.m. Saturday, Dec. 12. Jefferson Community Center, 3801 Beacon Ave. S., Seattle, free (206-684-7481). DEC. 12 Local artists’ work, music, art activities, art raffle, beverages and food trucks. VIP opening hour, 1-2 p.m.; 2-8 p.m. Dec. 12. Seattle Design Center, 5701 Sixth Ave. S., Seattle, free. Admission to VIP hour is $20 (southparkarts.org). DEC. 12 A sale of works by more than 30 local artisans with coffee, food, adult beverages, DIY screen printing, and a storewide sale. 11 a.m.-4:30 p.m. Dec. 12. Second Use Building Materials, 3223 Sixth Ave. S., Seattle, free (seconduse.com). DEC. 13 A holiday gift pop-up featuring local artists, illustrators, jewelry and clothing designers. Noon-4 p.m. Dec. 13. Bar del Corso, 3057 Beacon Ave. S., Seattle, free (206-395-2069 or bardelcorso.com). DEC. 13 Local record labels, small press, crafts, screen printing and more. 11 a.m.-4 p.m. Dec. 13. The Vera Project, 305 Harrison Street, Northwest Rooms, Seattle Center, Seattle, free (206-956-8372 or theveraproject.org). DEC. 19-20 A selection of indie-craft goods, DIY workshops and more. 11 a.m.-6 p.m. Dec. 19-20. Hanger 30 — Magnuson Park, 6310 N.E. 74th St., Seattle, free (renegadecraft.com/seattle/seattle-holiday-fair-details).